The Consensus in Pediatric Neurosurgery (CPN) module was developed by Professors Maurice Choux, Concezio Di Rocco and Christian Sainte-Rose, as a mean to reach a consensus in major issues of our subspecialty. It is organized on a biennial basis (traditionally in January - February), as an interim meeting between the ESPN Congresses’ organization, and hosted namely in Rome or Paris. The Scientific Program consists of plenary session tracks, which address questions related with the specific thematic and conclude with a consensus panel discussion. Since 2017, the Consensus Conference has officially been incorporated to ESPN’s educational activities. The Consensus Conference is followed by the ESPN Refresher Course, an opportunity for graduates of the ESPN Course cycle to follow up on the knowledge acquired. The topic is selected among the thematic of one of the Postgraduate Course’s annual module and its presentation is divided in a theoretical and a practical part. Short lectures are followed by round table and case solving discussions among expert members of the ESPN Courses’ Faculty, for the purpose of refreshing what was learned during the latter’s past editions and supplementing it with new developments. 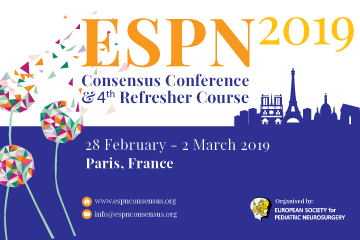 Thank you for attending the ESPN 2019 Consensus Conference and 4th Refresher Course.